Moon mining China's Moon rover will survey for minerals on a dusty, barren crater named the Bay of Rainbows, but experts say any 'pot of gold' may prove too costly to recover. The potential to extract the Moon's resources has been touted as a key reason behind China's space programme, which made its latest breakthrough at the weekend with the landing of its first lunar rover. State media said early Sunday that the rover vehicle had been deployed on the Moon's surface. It is the first such mission for 40 years, after the United States and former Soviet Union did so, and the first soft landing on the lunar surface of any kind since 1976. It marks the latest step in an ambitious space programme which Beijing sees as a symbol of China's rising global stature and technological advancement, as well as the Communist Party's success in reversing the fortunes of the once impoverished nation. China's space exploits are covered widely by the country's media, and have become a huge source of pride for ordinary Chinese. The Chang'e-3 mission is named after the goddess of the Moon in Chinese mythology, and the rover vehicle is called Yutu, or Jade Rabbit, after her pet. Luan Enjie, a senior adviser to China's lunar programme, told state media that the ultimate aim was to use the moon as a "springboard" for deep space exploration. Commentators believe doing so would require a base on the lunar surface. The Earth's natural satellite is also believed to hold uranium, titanium, and other mineral resources, as well as offering the possibility of solar power generation. Even the seemingly far-fetched prospect of using the Moon as a military facility from which missiles could be launched against "hostile military targets on Earth" was raised by the Beijing Times newspaper, citing "relevant experts" at a state body. 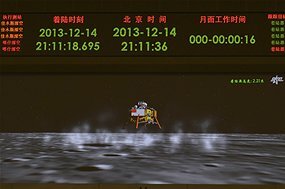 As various scenarios are discussed on China's hugely popular Internet message boards, the Yutu Rover is analysing minerals while crawling across an ancient 400 kilometre-wide plain known in Latin as Sinus Iridum, or the Bay of Rainbows. It is equipped with belly-mounted ground-penetrating radar, which observers say will be used to detect the minable quality of the Moon's crust. One substance thought to be far more abundant on the Moon than Earth is helium-3, an isotope of the element that official news agency Xinhua called the "perfect fusion energy source to replace oil and gas". Officials claim it could be used to generate power for more than "10,000 years", reports say - but the fusion reactors it could theoretically fuel do not yet exist in reality. "Everyone knows fossil fuels such as gas and coal will be used up one day, but there are at least one million metric tons of helium-3 on the Moon," Ouyang Ziyuan, a senior adviser to China's lunar programme, told Xinhua. Nonetheless the cost of such exploitation would be phenomenal. China has already poured tens of billions of dollars into its space programme. The current Chang'e-3 mission comes ahead of a second rover landing, Chang'e-4, and China is expected to bring samples back to Earth for closer analysis within five years from now. "The next stage is to do something that the Americans haven't done -- to do a bit of mining," said Richard Holdaway, director of Britain's RAL Space laboratory. "They have the technology to do it, they have the buying power to do it, they are strategically interested in doing it, so the bottom line is if they want to do it, they will," he said. The scientist compared China's interest in the Moon to that of many other countries in exploiting resources in Antarctica, saying such scenarios depend "entirely on the business case". But Karl Bergquist, international relations administrator at the European Space Agency (ESA), who has worked with Chinese space officials on various missions including Chang'e-3, said that mining the Moon remained "many, many years" away. "Here in Europe we believe the cost of carrying out such a thing makes the cost of extraction not commercially viable," he said. Successfully obtaining helium-3 would need a vehicle with a cargo bay the size of the space shuttle to land on the Moon, said Joan Johnson-Freese, professor of national security affairs at the US Naval War College in Newport, Rhode Island. "Even with the space capabilities, the fusion reactor is a long way off," added the expert on Chinese space activities. "The idea of mining the Moon is raised when politicians want an economic justification for space activities. It was used by the US and now is being used by China."